The Corinthian Classic Yacht Regatta recognizes Classic GRP (Classic Plastic) yachts as the fastest growing segment in “Classic Yacht Racing” today and we encourage and support all the participation we can get. If you've got a CCA era "Classic" than this is a P-E-R-F-E-C-T venue for getting out and really sailing her for fun and maybe a bit of glory. Who should be here? If your yacht was built of GRP (glass re-enforced fiberglass), has a transom that is counter style, and/ or built before 1970, you should be here! Have one of these or something like it? We'd love to see you. 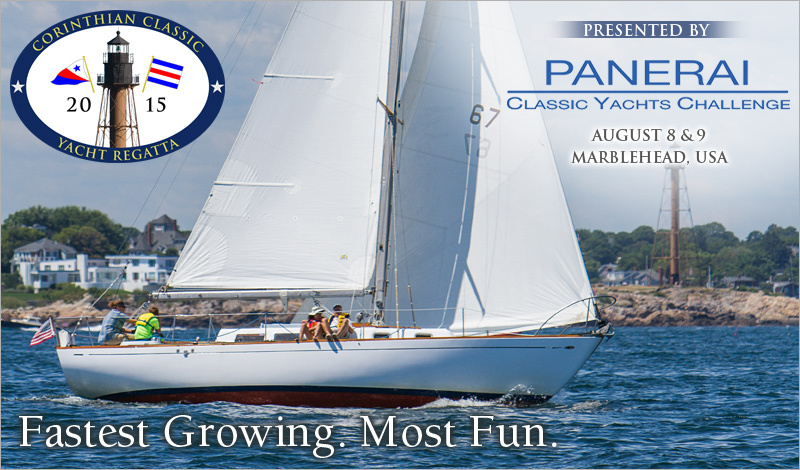 The 2015 Corinthian Classic Yacht Regatta presented by Officine Panerai (www.panerai.com), the title sponsor of the Panerai Classic Yacht Challenge Circuit that takes place in the Mediterranean, Marblehead, Nantucket and Newport will be held on August 8th & 9th. A good regatta happens on and off the water and you can expect that the Corinthian Yacht Club along with Panerai will put on a good show. There will be a cocktail reception during registration Friday evening; cocktails, dinner, presentations Saturday evening, and of course, more beverages and trophies after racing Sunday. We had 50+ boats in the CCYR in 2014 and we’re looking to be just as strong this year. It’s a lot of fun and it’s great racing. You own a "Classic", now it's time to have some fun with her. Instructions to enter can be found on our website at www.corinthianclassic.org.